MoreFounded in 1974, Rubinstein & Associates, P.A., has served the needs of individuals and businesses in Miami and throughout South Florida for more than 40 years.Offering comprehensive, dependable representation in all areas of real estate law, business law and litigation, we have become the trusted source for many throughout our region who seek the highest level of counsel and advocacy for their important and serious legal challenges.Backed by our extensive experience and utilizing a vast...Founded in 1974, Rubinstein & Associates, P.A., has served the needs of individuals and businesses in Miami and throughout South Florida for more than 40 years. Offering comprehensive, dependable representation in all areas of real estate law, business law and litigation, we have become the trusted source for many throughout our region who seek the highest level of counsel and advocacy for their important and serious legal challenges. Backed by our extensive experience and utilizing a vast network of professional resources, the attorneys at our law firm can deliver the customized solutions and effective strategies you need to help you protect your rights and interests and obtain the positive results you seek. Responsive and dedicated, our legal professionals can help you with any legal challenge you may face involving U.S. and international property law, real estate sales and closings, business mergers and acquisitions, financing and leasing, trademarks and intellectual property protections, labor and employment law, management and production issues, contracts, commercial litigation and more. Jeffrey Rubinstein, our founder, holds an AV-Preeminent peer-review rating* from Martindale-Hubbell, and he selected each of our associates for their impeccable professionalism and exceptional legal abilities. 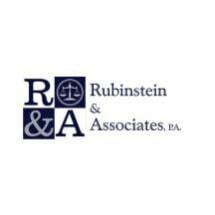 This means that by working with Rubinstein & Associates, P.A., you can expect the best possible counsel for your legal issues from a highly skilled and ethical attorney. For more information about how we can best serve your needs, you can contact our law office to schedule a free initial consultation.